My appetite disappeared when we first got to Phnom Penh due to the heat, jet lag and the cold I was still getting over. When I finally started to feel hungry again, the sizes of Cambodian dishes felt like plenty. I knew that portions in Asia were supposed to be smaller than those in the United States, but I guess I adjusted without noticing. That said, there have been moments when the size comparison was obvious. 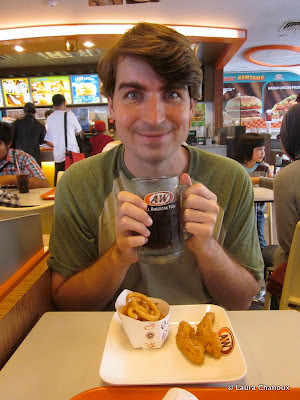 There were A&Ws all over Indonesia and at the Surabaya airport I convinced Eric to stop in one. Sadly, they didn't serve hot dogs — I was only a little heartbroken — so we went for chicken strips. The meal came with three strips and a small container of fries. I'm not sure a kid's size in the US would be that small. In other news, Eric waited two more weeks to cut his hair. This looks like the first sign that returning to western foods and portions might be a challenge for me. We're headed to Turkey* in August, back to richer dishes that include cheeses and heavier sauces. Until then, I'll be eating as much curry and noodles as possible. Have you noticed changes in appetite or diet as you've traveled? I couldn't decide on a final food photo. *Eric and I visited Istanbul briefly in 2010 and one of my enduring memories is getting yelled at by a Turkish waiter when I was too full to eat all the food on my plate. After today, I'm starting to get a little worried.